All items ship between 3-5 days after order is placed using first class shipping with delivery confirmation. Wholesale orders ship through priority mail with delivery confirmation for easy tracking. Please contact us directly if you need an item rushed to you through UPS or Fed Ex. 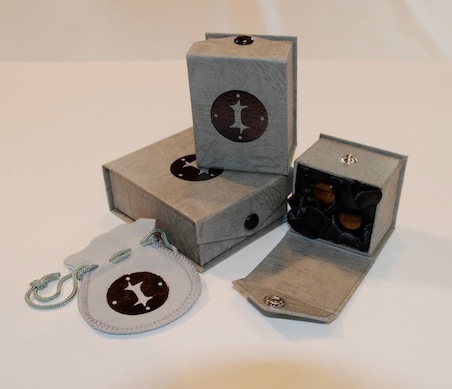 With the exception of sale items, all orders ship in custom made gift boxes, designed to keep you jewelry safe. For a limited time we are including free Intrepid Jewlery pouches as well with all orders. 100% satisfaction is very important to Intrepid. If for any reason you are not happy with your earrings, the item(s) may be returned within 30 days, provided they are unused and have not been worn. All jewelry is packaged and shipped in sealed bags. Return are allowed only if the seal has not been tampered with and is unopened. Shipping Fees will not be refunded. We accept money orders, paypal or you may pay with Google Checkout to pay with a credit card. Orders payed with by a money order will not be shipped until after the money order has reached us. Personal checks are not accepted.